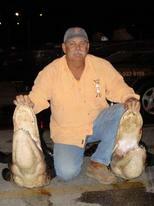 At Bobby's Guide Service, we are sure to make your gator hunt a fun and memorable one! Our alligator hunts are fully guided and offer a unique opportunity at a truly exciting alligator hunting adventure. Our hunts take place on Lake Okeechobee. Our affordable rates and experienced guides make this hunt a one of a kind. ​*If you purchase your own tags, please call for pricing. A deposit of $100 is required to confirm your reservation. We accept cash, checks and all major credit cards.